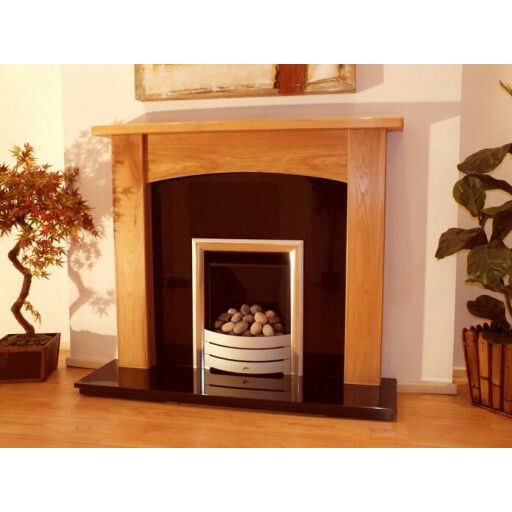 The Abbey 54" Solid Light Oak fireplace surround is an exquisite addition to your home. The natural beauty of the light oak soothes and caresses the senses and makes a perfect companion to the dancing flames that will soon be held within. While you are certainly able to add an extra touch, such as a cast iron insert, the Abbey is more than beautiful enough to stand on its own. The neutral tone means that it can find a perfect match for any decor that you choose to use in your home. The light oak is kiln dried and is of the highest quality. It comes with a one year warranty in case any trouble arises but we doubt you will need it as the name Abbey is synonymous with high quality materials and craftsmanship. Additional hearth and back panel options made from granite, marble, limestone, and Bolton casting are suitable and there are several recommendations that we have added as pairings for you to choose from but even if you choose only the surround, we are sure you will be pleased with the results. WENT TO THE FIREPLACE WAREHOUSE STORE LOOKING AT SOLID OAK SURROUNDS AND BOUGHT THE ABBEY 54 INCH SURROUND UNBELIEVABLE VALUE. Like other reviews have said,great value solid oak surround,looks really nice with the Limestone Hearth. Great value for money and looks really nice in our living room.